The BP oil explosion in the Gulf of Mexico hits close to home for me, literally. I grew up in Mobile, Alabama and my parents are watching the arrival of the spill. Morrison said that if MMS were going to rewrite the rules, it should develop a “performance based” rule rather than a “detailed, proscriptive” program. 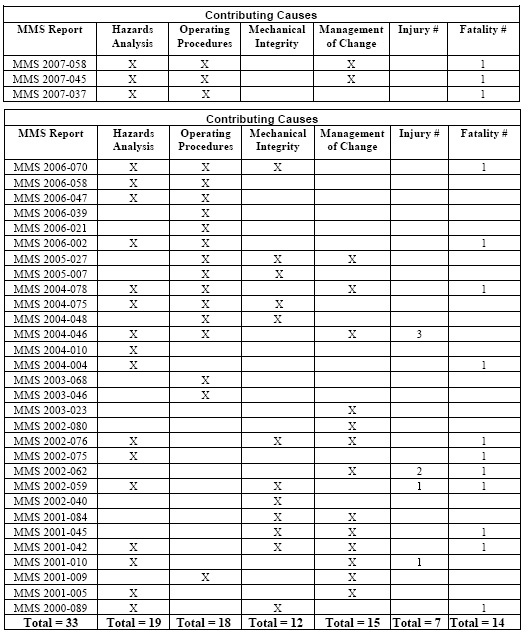 MMS regulations historically have focused on proper equipment operation, but the agency said at the time that equipment failure is rarely the primary cause of incidents. In an effort to regulate the industry, past oil rig accidents were coded as to the recommendations made by the accident reports. These could include requiring: Hazards Analyses, Management of Change, Operating Procedures, & Mechanical Integrity. The definitions for these can be found in the document linked below, but in general it’s important to see how few recommendations concerned mechanical failures. From the proposed rule by the Interior Department.